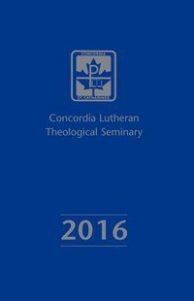 CANADA – Concordia Lutheran Theological Seminary (St. Catharines, Ontario) is again pleased to offer to the church the annual Pastor’s Desk Diary. It contains readings from the three-year and one-year lectionaries, including variants for the major Lutheran churches in Canada (Lutheran Church–Canada, Evangelical Lutheran Church in Canada, and Wisconsin Evangelical Lutheran Synod). The original work of Thrivent Financial in the United States has been adapted to the Canadian calendar. Although the seminary can no longer offer the diary for free, the cost has been kept to $19 (plus shipping and GST) through the support of advertisers. The diary is available through lulu.ca, an online, print-on-demand service. You may order your diary, which will be shipped directly to you, by searching on lulu.ca or following this direct link: http://www.lulu.com/content/paperback-book/lutheran-pastors-desk-diary-2016/15517953. The seminary ask you to please note that you must order the diary yourself. The seminary produces the diary as a service to the church and does not make a profit. As a result, the seminary’s paid staff cannot be expected to order the diary for you. If you have difficulty with online ordering, please ask for help from a family member or parishioner.